258 pages | 21 B/W Illus. The existence and persistence of regional disparities between European regions require context-tailored policies to promote structural change. This book explores the congruence between place-based development and regional competitiveness in the EU context. 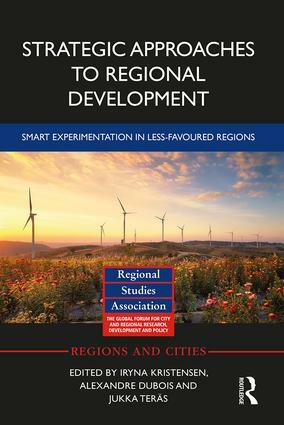 Drawing on a range of social science disciplines, this book unpicks the complexity of regional transformation processes, aiming to enhance the applicability and transferability of theoretical approaches to innovation and place-based regional development in diverse European territorial settings. The contributors have a particular focus on less-favoured regions and on the application of Smart Specialisation – a strategic approach to innovation-based regional development – to the issues at hand. The book comes at a critical moment, meeting the growing demand of academics, practitioners and policymakers with an interest in promoting regional economic growth and well-being. Iryna Kristensen is Senior Research Fellow at the Nordic Centre of Spatial Development (Nordregio) in Stockholm, Sweden. Alexandre Dubois is a researcher at the Swedish University of Agricultural Sciences in Uppsala, Sweden. Jukka Teräs is Senior Research Fellow at the Nordic Centre of Spatial Development (Nordregio) in Stockholm, Sweden.